Damping-off diseases occur as seed rots and blights of seedlings. 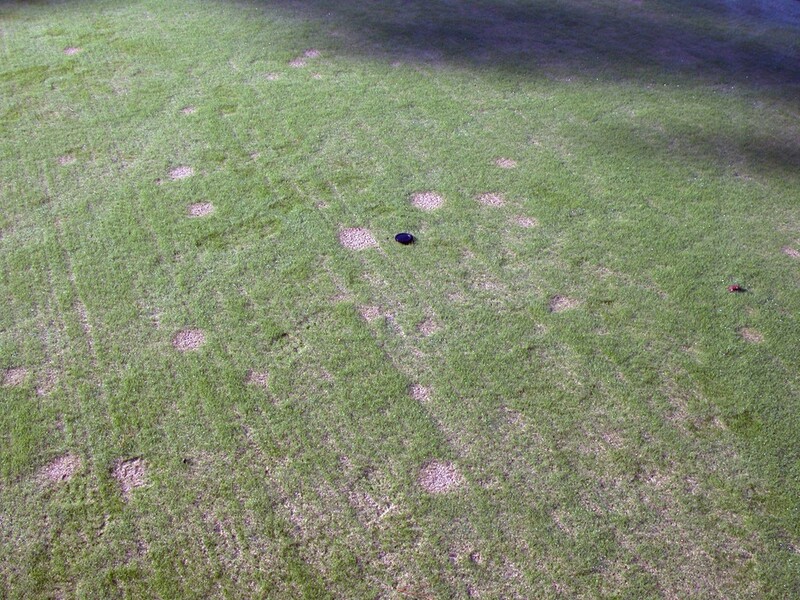 This disease seldom occurs on grass planted in early fall or early spring. However, in seedings from May to August, especially if hot, wet weather persists, seed may decay prior to germination, or new seedlings may become diseased and die. Seedlings become blighted, then collapse and die, forming circular or irregular patches. Affected plants often appear water soaked and slimy. 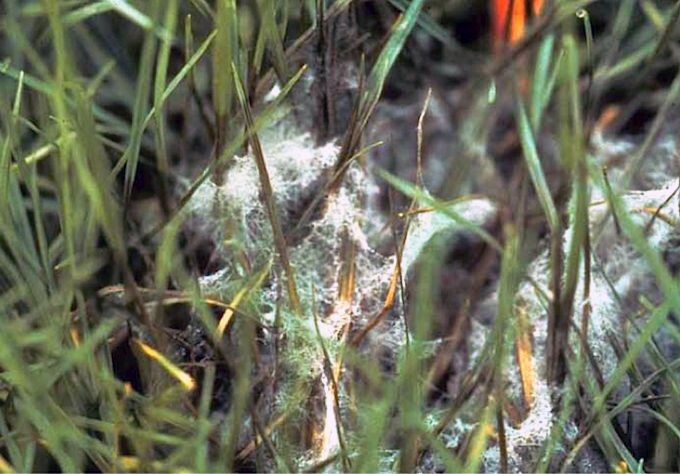 Sometimes mycelium can be seen on dew-covered grass in early morning. The dead tissue may mat together somewhat like paper-mache and form a crust over the soil surface. Most soils contain fungi that can attack seeds and seedlings. When conditions are favorable for grass seed germination and growth, as in the early fall and spring, these organisms usually are of little significance. Warm, wet weather, however, is more favorable for damping-off fungi and less favorable for seedlings. Under these conditions, fungi can severely damage seed and seedlings. Damping-off outbreaks are triggered by high temperatures and humidity, water-logged soils, excessive fertilizer, or an excessive seeding rate. In warm weather, higher-than-normal rates of seed may produce a very dense stand of seedlings that will hinder the escape of moisture from the soil surface. Such wet conditions over long periods of time are ideal for invasion by damping-off fungi. High rates of fertilizer can produce a succulent turf that is more susceptible to attack by damping-off fungi. With new seeding techniques, such as hydroseeding and hydromulching, seeding is done all year round, and as a result, damping-off has become a more frequent cause of stand failure. Stand loss to seed decay or seedling blight makes successive attempts to reseed the dead areas more difficult. Cultural control of damping-off diseases is based on providing favorable conditions for germination of the grass seeds and growth of the plants while minimizing the conditions that favor the fungi. Often, this can be accomplished by planting in spring or fall when temperatures are cool and grass grows well. For summer seedings, prepare a good seed bed, select a seeding rate sufficiently low so that the stand is not too dense, do not apply excessive amounts of fertilizer, and prevent free water from standing on the soil surface. Avoid using excessive quantities of mulch following seeding. Three types of chemical control methods may be used with new turf seedings: fungicide seed treatment prior to seeding, fungicide drenches or sprays on the soil after seeding, and/or fungicide sprays on the young seedlings. Each method can be effective, and the choice offers the possibility of chemical protection at various intervals during turf establishment. Selection of fungicide control practices depend on the site, the type of grass seeded, the seeding rate, and the environment at establishment.